Listing courtesy of Val Hacopian (CalBRE #00978258), Re/Max Optima. 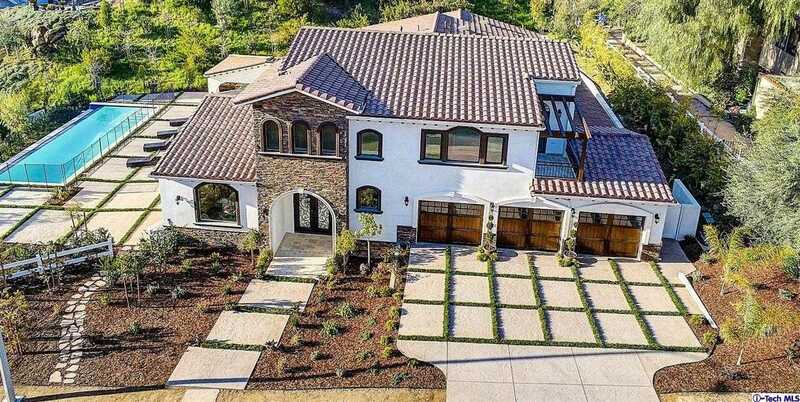 Presenting this newly built custom Tuscany Villa style estate in the prestigious guard-gated equestrian community of Bell Canyon. Captivating custom stone work around the entry outlines the iron and glass double entry door. Open floor plan with large windows brings light into the living and dining room with large porcelain tile flooring. Entertain stylishly at the wine bar and chef’s dream kitchen, large center island with seating, granite counter tops, custom built cabinets, Subzero Wolf kitchen appliances, and pantry. Guest room with full bath and huge master suite on the main floor with fire place, soak-in tub, dream walk-in closet with a magnificent krystal chandelier. Upstairs offers an office and three large bedrooms with en-suite full baths, walk-in closets, balconies, and wood floors. Folding back the family room’s glass corner doors virtually adds 900SF to the first floor opening up to the huge lanai and bbq area. The resort-style backyard, with almost 1200 SF of entertainment space, offers a custom bbq island, custom built infinity pool, fire pit, beautiful grounds fully landscaped with irrigation system. 3 car garage and spacious utility room with ample storage. Community has miles of trails, gym, park, and equestrian center. A must see! Building size: 5081 sq ft.